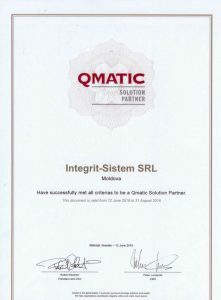 A new level of collaboration – Integrit-System S.R.L. After the effort made and a number of projects created according to European standards, as well as due to the considerable development of the IT field in the Republic of Moldova, Integrit Sistem has achieved the official status of a partner for the implementation of Qmatic solutions. The company’s employees have obtained certificates confirming their ability to provide specialized services and are ready to offer them to their customers.